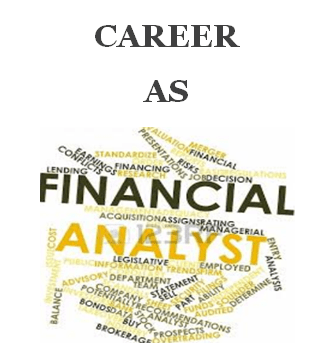 Financial analyst career is always dealing with numbers , investment strategies and also analyzing the financial environment. In one line we can say “how to use and create money” seriously the role always deals with money some or the other way. If your favorite subject is Mathematics,if you don’t get bored with the subject then you will love your job. Educational qualifications: To become a financial analyst you need to have a minimum Bachelor of commerce (B.Com) OR Bachelor of Arts with economics and statistics as optional subjects. Additional degrees such as Master of Business Administration in finance from best B-Schools , Top educational institutes like IIM’s,XLRI,ISB etc., M.Com, Chartered Accountant (CA) will be an added advantage for more employment opportunities. Even Post Graduation diplomas will be helpful. Skills required for a financial analyst: In order to become a full time financial analyst you need to have good knowledge with calculations , investment strategies, as a financial analyst you need to maintaining more information hence you need to have good hands on experience with MS-Excel and MS-power point , understanding financial environment and upgrading the knowledge from time to time and forecasting the future for various investments, communication and interpersonal skills are mandatory for a financial analyst . Employment opportunities for financial analyst : more the skills more the compensation and opportunities which comes through experience and knowledge acquired. So , you can go for the institutes where they offer internship opportunities with best organizations. Likely, CRISIL certified analyst program is a two year intensive program which offers work while you learn which covers your coursework as well you will be exposed to interactive workshops with various top known financial analysts and organizations. University of Delhi is offering a full time graduate program in financial and investment analysis which is mainly focused in training in financial analysis. Diploma program in Financial planning and Wealth Management. M.Sc. Tech Finance which mainly focus on financial engineering along with computing knowledge. Hence, these are the top most best institutes offering the course of financial analyst and after the completion of the course their will be more employment opportunities in banking and Insurance sectors apart from Business organizations.